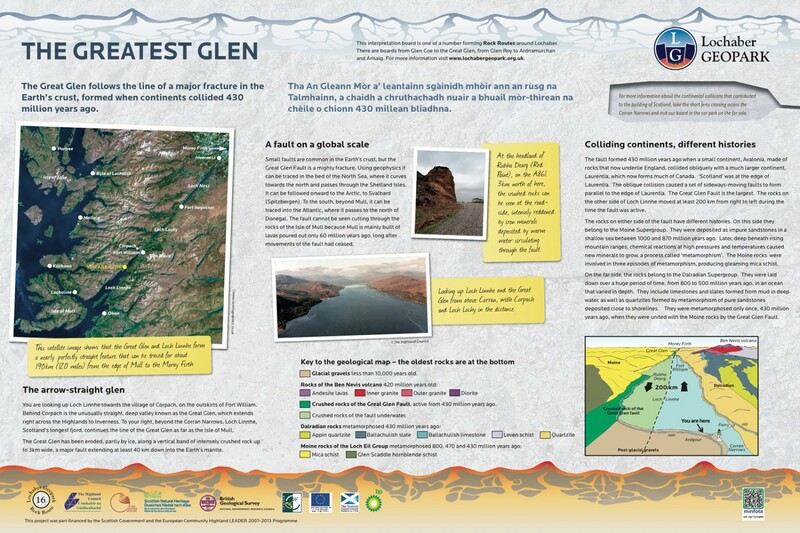 The board describes the origin of the Great Glen, gouged out by ice along a fault line formed by an oblique collision of two continents (Laurentia and Avalonia) over 430 million year ago. The board describes how the fault is composed of crushed rock and extends in excess of 40 metres into the mantle of the Earth and over 190 km in length. 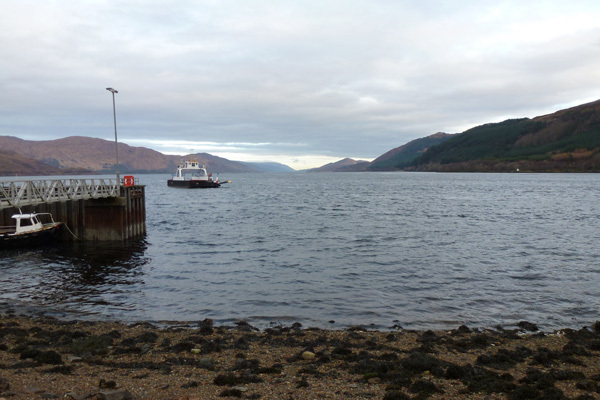 The fault line separates the Northern Highland terrane from the Grampian Highland terrane, and is occupied by a chain of long, narrow freshwater lochs (Loch Linnhe, Loch Lochy and Loch Ness). The Northern Highland terrane consists of the Moine Supergroup, sedimentary rocks laid down between 1000 - 870 million years ago. The board describes how these were later subjected to three metamorphism events, producing mica schists. 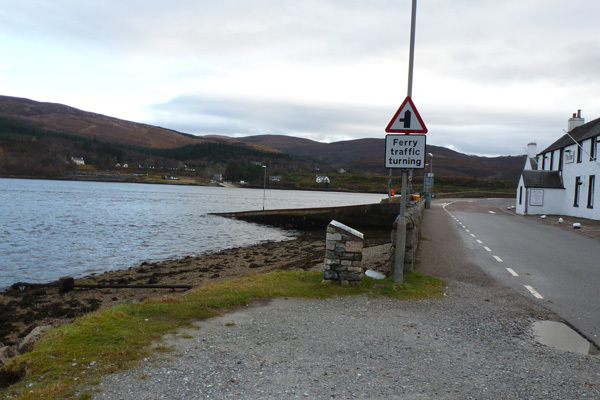 The Grampian Highland terrane consists of the more diverse Dalradian Supergoup formed from sedimentary rocks (sandstones, limestone and shales) laid down between 800 to 500 million yeas ago. These rocks were metamorphosed during the collision between the plates. 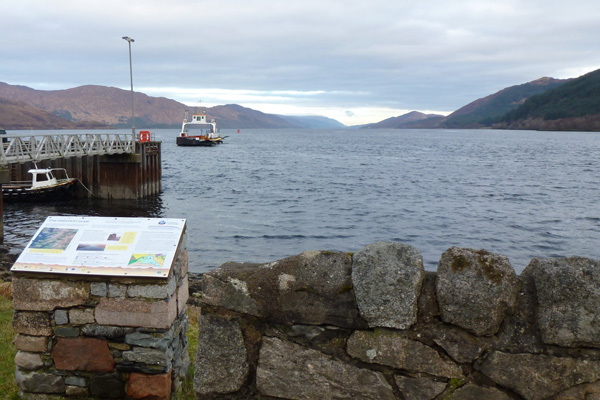 The board sited near the Corran ferry crossing at Ardgour. 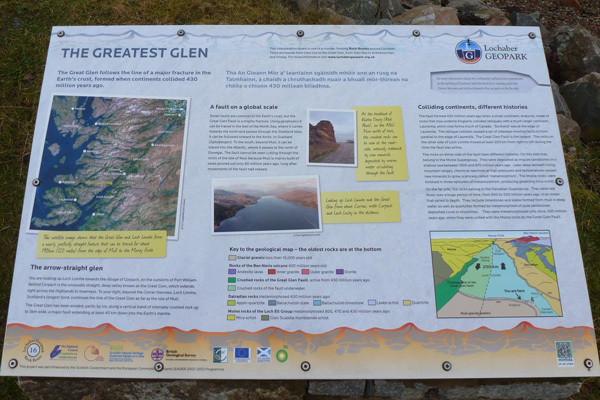 The board provides a fascinating insight into the geology along the Great Glen.